New Segura Patriot jacket. 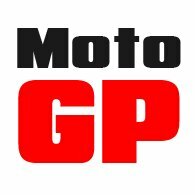 Exclusive to Motolegends. 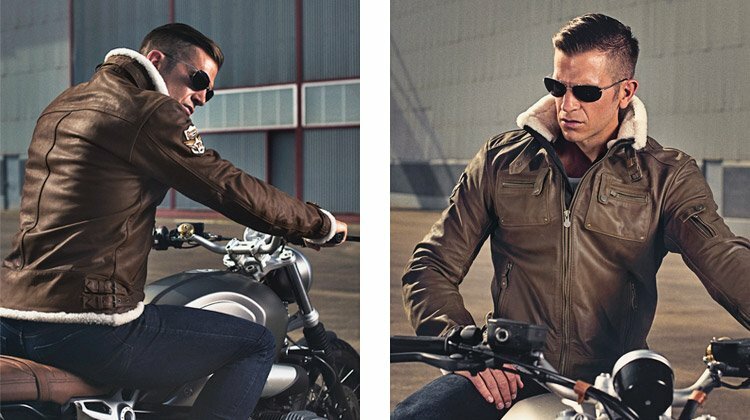 We’ve noticed that, for the coming season, there are lots of new motorcycle jackets that take their inspiration from World War 2 flying jackets. 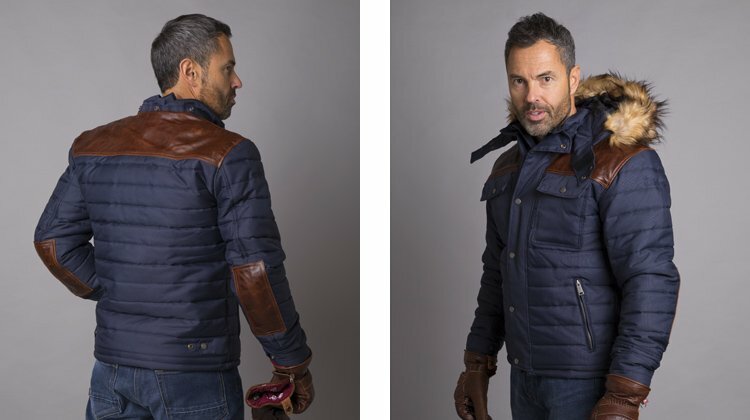 The Patriot, from French manufacturer Segura, is one such jacket. It’s not part of the range that the importer will be bringing into the UK, so it will be exclusive to us. It’s not a copy of any particular jacket like the Irvin or B2; rather it borrows styling cues from a number of different models. It’s made from a buffalo leather, so it has a slightly worn and beat-up look about it from new. It’s not going to need a lot of wearing to give it a really authentic patina. The sheepskin trim around the collar, hem and sleeve ends does not extend throughout the jacket, so it’s not the kind of jacket that you’ll only want to wear in the winter. In fact, it’s mesh lined and quite light and easy to wear. You get strap adjusters at the neck, waist and sleeve ends. There’s also a zip at the ends of the sleeve to help getting it on and off. There are four pockets on the outside, one on the arm and three inside. CE armour comes as standard in the elbows and shoulders. A pocket is provided for a back protector. It you like the whole Ted Simons (Jupiter's Travels) look, but want a comfortable and totally modern biking jacket, then the Segura Patriot fits the bill. It was a couple of years ago that Roland first released his Mojave boot and, in typical Sands fashion, it was a little bit different to other boots on the market. It was made from genuine cowhide, had a Hipora waterproof membrane, a shank in the sole, and reinforcements in the toes, heel and ankles. But it looked different to anything out there, and Roland gave it a unique wedge sole without a separate heel piece. Apparently, this was a carry over from his racing days. He took the view that a heel looks right on the street, but for moving about on the bike a heel can sometimes get in the way. But he wasn’t happy with any old sole, so he had Vibram make him a special one with a zig-zag sole pattern for grip. He chose Vibram, obviously, because he wanted lightness, the highest levels of shock-absorption and durability. The boot has always been popular, but the colour that sold best was the oxblood, which has unfortunately been out of stock for many, many months. Well, the good news is that it has just come back into stock. We’ve now got a plentiful supply, although not in every size. Right now, we’ve got them in a UK 9, 10 and 11. So it’s good news and bad news. Good news if you’re one of these sizes. Not so good if you’re not! Okay, so we’re jumping the gun here a little, so you might want to view this more as a ‘heads up' than news of a recent release. Within a few weeks, and most certainly before the end of January, Shoei will be releasing its new Neotec 2, flip-lid helmet. Now here at Motolegends, we’ve always been huge Schuberth fans, and we rate the C3 Pro very highly indeed, but we have been testing the new Shoei for a few months, and we think it’s a very special bit of kit. Shoei has spent four years developing the helmet, and it raises the bar in the flip-lid market. With no less than 18 different liners and five cheekpad sizes, we reckon that rare is the person we won't be able to make comfortable in it. It’s exquisitely made. The engineering is first class. Everything feels solid, and everything works as it should. From our testing, we reckon it’s as quiet as anything out there. 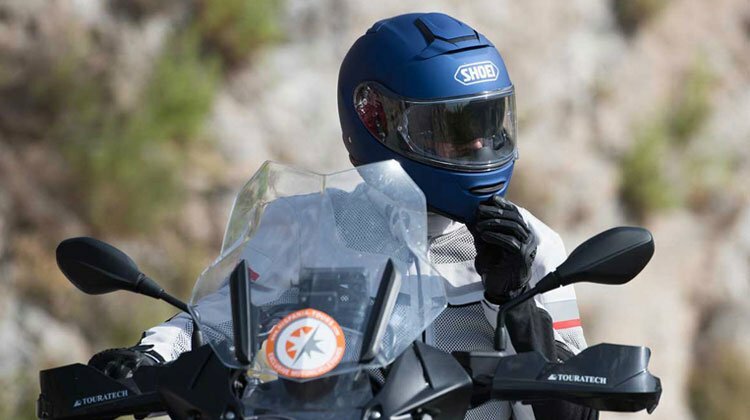 The new Sena comms., based on Sena’s 20S system, is superior to the Schuberth system. And the Pinlock, as you would expect, is the top Evo model. If you’re in the market for a new flip-lid, you’ve got to look at the Neotec 2. We love the Schuberth, but the Shoei bests it in a number of areas. To read more about it, click on the editorial story below. It'll be here very soon. 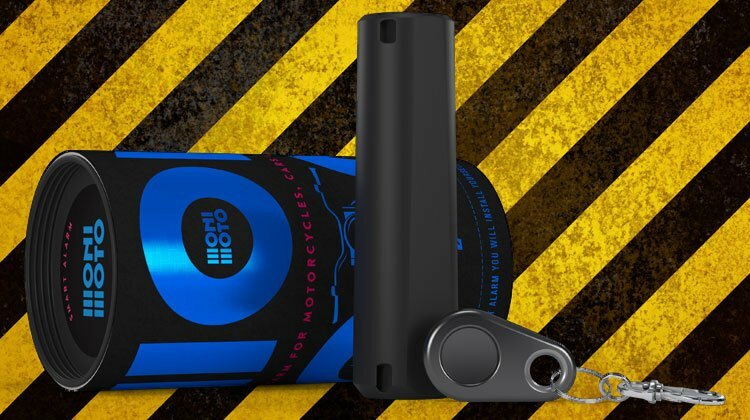 Just in is a new alarm and tracker device for motorcycles that goes under the name of Monimoto. It’s really clever, requires no technical skill to install, and costs virtually nothing to maintain. In the box is a small tracking device that you secure discretely somewhere on the bike. Supplied in the box are a couple of zip-ties for this purpose. You install a couple of small batteries that, in normal circumstance, will keep the device working for up to a couple of years. Then simply download the app and configure to your requirements. When the Monimoto key fob is in place on the bike , nothing happens. But if the bike is knocked or moved when the key is not in the bike, you will be phoned and given a GPS location for the bike. If the bike is on the move, you will get an updated location every five minutes. If it’s stationary, you’ll be notified every 30 minutes. There’s no subscription fee, but after the initial two months, you’ll pay a monthly charge for the SIM card of about three Euros. Tens of thousands of motorcycles are stolen in the UK every year, but only 15% are ever recovered. The Monimoto will increase you chances of being one of those one in six who ever sees their bike again. For not a lot of money, you can now very simply stack the odds just a little bit more in your favour. Halvarssons is a touch of class. These guys don’t over-charge for their gear. It’s excellent value and, as a result, you very rarely find it being discounted. Blaze jeans in grey. Qurizo suit in sand. Panzar jacket. Ladies Electra and Prince. Ladies 310 leather jacket in red. Ladies Seventy jacket. Raggy fleece. Primus mitten. Origo glove. Carat leather jacket. 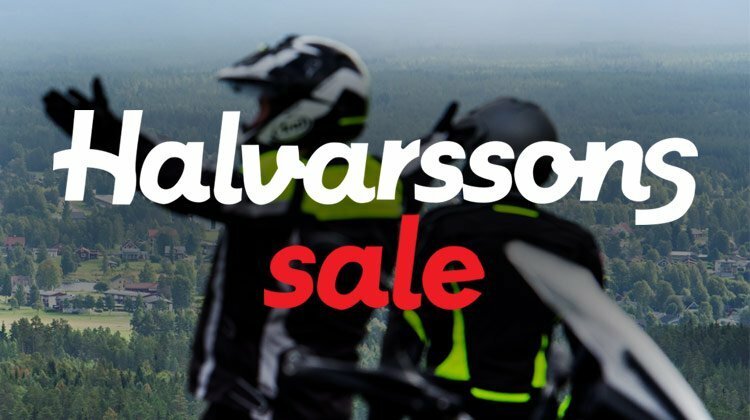 To go to our Halvarssons Sale pages, click below. ‘What’s New Pussycat’ is our weekly bulletin that’s been designed to tell customers what new has just come into stock. But at times, we get excited by imminent new arrivals, and don’t want to miss the opportunity to give our customers advanced warning. 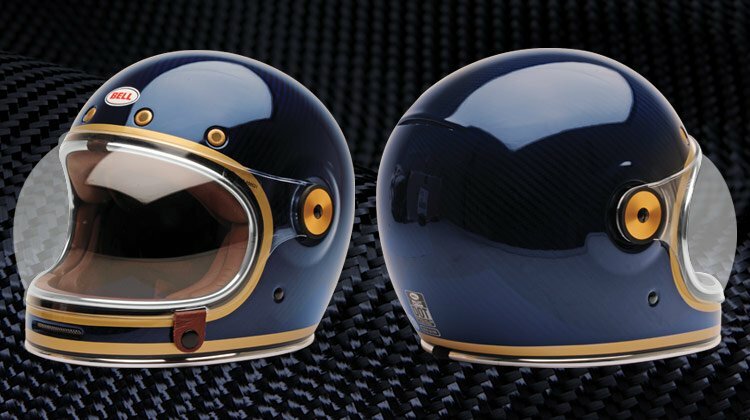 One such case is the soon-to-land Bell Bullitt helmet in blue carbon candy paintwork. Now, the Bullitt has been around for a few years now and, although it has had its imitators, it still sits much higher on the ‘Cool Wall’ than any other full-face helmet out there. It’s not a helmet you would commute long distances in, and it would be difficult to install a comms. package in to it. For touring there are certainly better options. But if your riding is normally around town, or if you’re riding something retro or custom, and like to cut a dash, then the Bullitt is the perfect helmet. Some time ago, Bell released a limited edition in blue carbon candy. It was a huge hit, and sold out very quickly, commanding large premiums on eBay for a while after it disappeared. Well we asked Bell to re-release; and they have now done so. But only 150 have been produced, and they will only be available from a handful of dealers. So, if you want one, you need to be quick. The helmet is gorgeous. It’s made from carbon, which only some of the Bullitts are. But what makes the helmet is the translucent blue paintwork through which the carbon weave is clearly visible. The other piece of good news is that Bell has held the price down to that of the original, so it’s actually a bit of a bargain. It’s expected any day now, so don’t hang around. This is emphatically not the kind of boot you would wear if you were setting off to travel around the world. 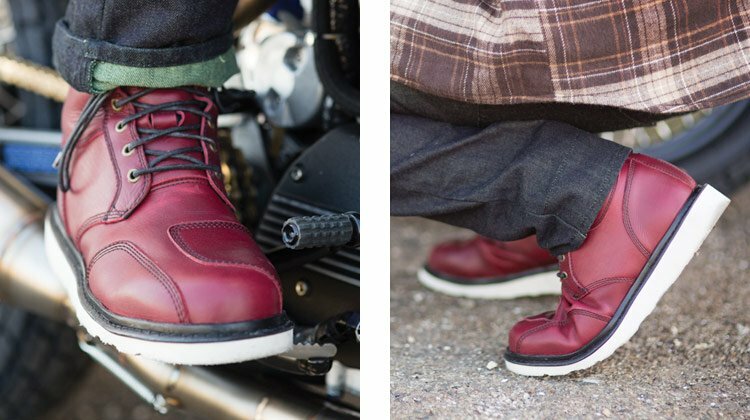 But if you’re looking for a properly protective motorcycle boot that you can ride to work in, then wear all day, it’s perfect. And it is a proper biking boot. Made from full-grain leather, the sole has been stiffened, and you get protectors for the ankles, heel and the toes. Importantly, the boot comes with Gore-Tex’s Performance Comfort liner for waterproofing. The bottom line is that you can probably buy a much cheaper pair of boots on the high street that look just like these. But they won’t have a waterproof membrane, they won’t be CE approved, and they won’t protect your feet in the way these boots do. We think they’re very smart indeed. We do some terrific short boots that are great to wear. But most of them are too chunky and workmanlike to wear to the office. Wear these TCXs with a suit, and nobody in the boardroom is going to know you didn’t get them on Jermyn Street. We drove in to Paris in the rush hour a couple of weeks ago, and it quickly became clear that jackets like this are all the rage for continental commuters. They seemed almost ‘de rigueur’ for scooter riders, but plenty of GS and naked bike riders were wearing them too. Of course, the Helstons version is top of the tree. It’s made from a highly abrasion resistant outer fabric, but it has leather reinforcement panels on the shoulders and elbows. Obviously, it’s going to be warm as anything you’ll ever ride in. And, as you would expect, there’s a waterproof membrane to keep you dry. There are two zip-up interior pockets and four pockets on the outside. You get adjusters at the waist and on the sleeve. The fur lined hood is removable if that’s not your thing. Whilst, for protection, there’s CE armour in the elbows, shoulders and back, It’s a rather superior kind of jacket. It’s as stylish a piece of motorcycle wear as you’ll ever find. It will appeal to those who ride a bike, but who don’t want necessarily to look like a hairy-arsed biker when they’re off it. We think it’s totally brilliant. 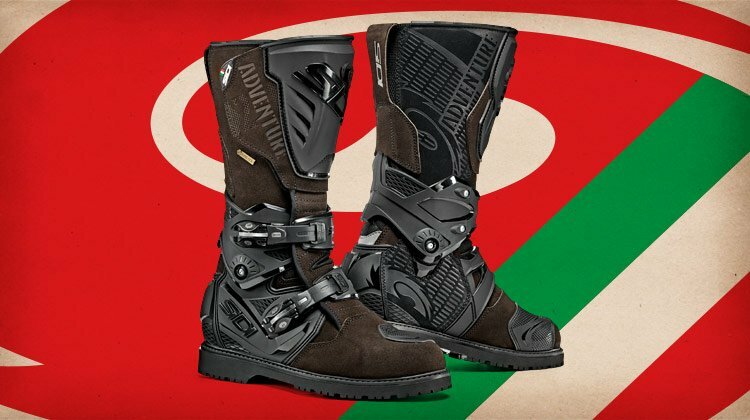 The Sidi Adventure 2 boot itself is not new, but this new brown colourway is. The Adventure 2 is almost certainly the best adventure boot on the market. It’s not the ultimate in off-road protection. For that, you need to get yourself an all-plastic, motocross boot. But if you want to combine the protection of a proper off-road boot with the comfort of a road boot, there’s not really much that can match it. 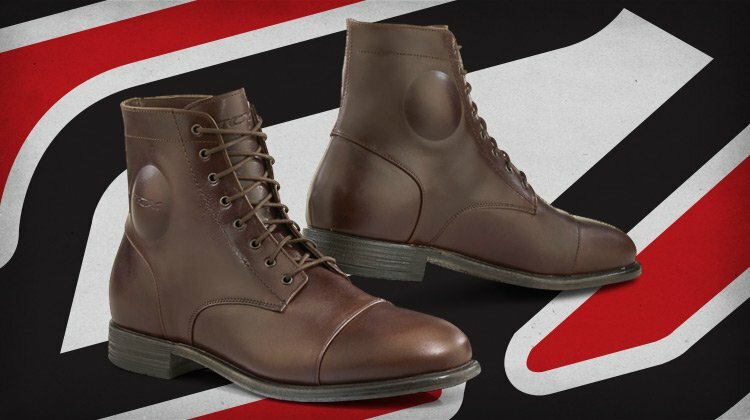 For some people these days, an all-black boot is just a bit too aggressive, and so in the last year or so, many manufacturers such as TCX and Falco have brought out off-road boots in browns and khakis. As the market leader in the arena, Sidi felt it needed do likewise. The new boot, of course, gives nothing away in terms of comfort or protection, and you still get all the bits and bobs you would expect; like a PU shin plate, buckle adjusters, a Gore-Tex waterproof liner, flexi panels at the ankle, an elasticated area on the calves, reflective inserts, an ergonomic inner sole with a removable arch support, and so on. With their brown suede panels, they're really very tasty. And they’re on the shelf now.